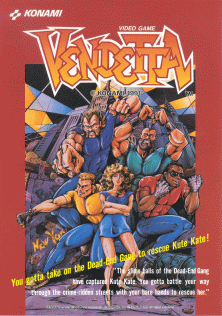 Vendetta features a hero gang called The Cobras, which consists of five members: Blood Hawk, Boomer, Sledge, and Kate. One day, Kate is kidnapped by the Dead End Gang under the leadership of Faust. The four men go save her, fighting enemies that are sent against them. A review of the game is avilable here.